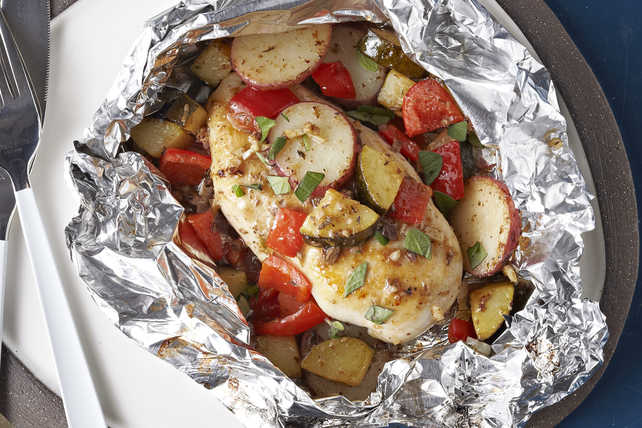 Place 1 chicken breast on centre of each of 4 large sheets heavy-duty foil; top with vegetables, garlic and dressing. Fold to make 4 packets. Grill 30 to 35 min. or until chicken is done (170ºF). Cut slits in foil to release steam before opening packets. Sprinkle with oregano. If the chicken breasts in your market are larger than 1/4 lb. (115 g), they will take longer to cook. Be sure to cook them long enough so that they are no longer pink in the centres and the juices run clear. The zesty flavours of this grilled dish make it a delicious addition to your healthy eating plan. And as a bonus, it provides a good source of iron, per serving.